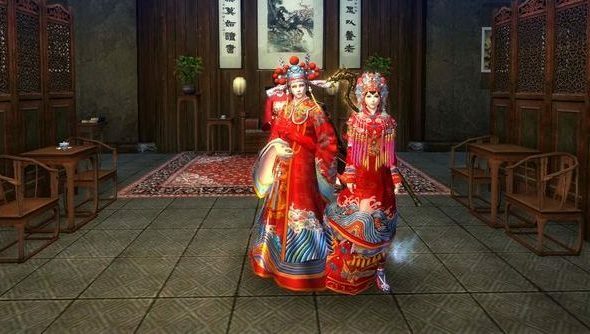 Marriage might be about compromise and never quite getting to the cinema, but weddings can be about ostentation and chinese lanterns – particularly in an MMO, where the bill rarely exceeds a $10 subscription fee. Age of Wushu is now in the very good company of Ultima Online and WoW in hosting such ceremonies on its servers, and its developers have released a trailer for the occasion. 1. The Three Bows: The pair will begin the ceremony with a bow to the heavens and the earth, a bow to the hall of grandeur, and finally a bow to each other. 2. The Parade: The groom will be upon a white horse (or an ox) and the bride upon a luxury palanquin (or a second ox). Fireworks, flower sprinkles, red envelopes and ecstatic joy will accompany the parade to the heart of city. 3. Wedding Banquet: A feast will commence with guests from all over Jianghu, crash it or love it! 4. Bridal Chamber: The final stage of the wedding ceremony where the pair perform a dance show for the guests, ending with the groom carrying the bride back to the bridal chamber. If that last part sounds a tad too Game of Thrones, the build-up is more romantic. After a proposal and a Betrothal Gift, the groom chooses a wedding package – ranging from your bog standard ox ride to a lavish palanquin parade. Then a date is set, and invites are sent out. Sounds like hard work – but probably one of the better ways to get married to somebody on the internet. What do you reckon?